It is a sad reflection of the times that cricket writing now has to include a section on the unsavoury and underhand dealings of international cricketers which - presumably -started in the last generation. 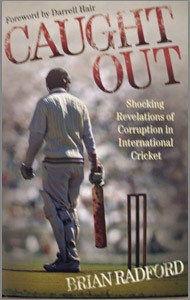 Brian Radford's Caught Out is therefore essential reading for those either interested or curious about the murky events which have sullied cricket in the recent past. Brian Radford's experience as an investigative sports journalist means that he is perfectly positioned to write such a book and the twenty chapters cover match fixing, drug taking and smuggling, death threats, betting and the pressure exerted behind the scenes by dubious individuals on players. It is easy to be critical when unsavoury news breaks but this book gives details of the hold that such individuals have over players and can offer an explanation for their actions. The Foreword has been written by Darrell Hair whose stance at The Oval Test between England and Pakistan in 2006 is well documented in one of the chapters. The book starts with the introduction of the Condon Anti-Corruption Unit and sets the scene for the unappetising and previously unknown events which shocked the cricketing world. As well as the well-known cases of Hansie Cronje and the Indian bookmaker M.K.Gupta, this book chronicles not just match fixing from when it first became common knowledge to the no-ball saga of last summer but also ponders whether Bob Woolmer died of natural causes or was murdered. The Michael Atherton dirt in the pocket is written about as is Chris Lewis's fall from grace following drug smuggling in 2009. The Stanford saga has a chapter devoted to it as is England's 2005 Ashes victory when reverse swing was achieved through Murray Mints sucking. Other subjects covered are the unseemly verbal confrontations - "mental disintegration" - ball tampering and spats with umpires. There seems to be a lot of pressure on players, umpires, officials and the media. Easily and forthrightly written, this is a very interesting book on the less savoury aspects of the game. Let us hope that it may help to eradicate the problem.